Dr Alfred Carr sailed to Australia on the Araminta arriving in Geelong on 04 October 1852. He qualified as a member of the Royal College of Surgeons in 1842. He died in the Ararat Asylum in June 1894. In 1854 Dr Carr was conducting a hospital with Dr George Clendinning at Red Hill, Ballarat. He was the closest doctor to the Eureka Hotel, there was the first doctor called with George Scobie was murdered. He preformed the autopsy Dr Alfred Carr was a witness at the Inquest into the death of William Hardie on 04 December 1854. Martha Clendinning, claimed to have piece of Eureka Flag given to her by Dr Alfred Carr. It was reported that Dr Alfred Carr was struck by a bullet fired by a sentry, soon after the Eureka Affair. On Friday night the Camp Surgeon and Dr. A. Carr had a narrow escape from being shot; owing to some blunder, while the former gentleman was going into the Hospital he was fired on by one of the sentries. How this happened I do not know; the ball barely missed him, went through the wooden wall of the hospital, through the lid of the medicine chest, which was open at the time. and passed close to the shoulder of Dr. Carr, who was reading in the hospital; some. splinters from the lid of the chest struck Dr. Carr on the side. The "Criterion" conveyance brought up the papers, on Saturday, under six hours; some of them were delivered before half-past Twelve. 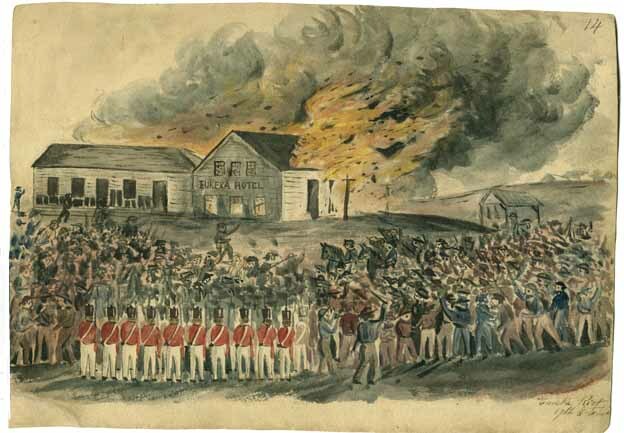 Dr Carr was a witness examined during the report of the Board appointed to enquire into circumstances connected with the riot at Ballarat, and the burning of James Bentley's Eureka Hotel. He returned to England for a holiday in 1855, returning to Victoria on the Persia in 1857. He was suffering from mental illness and he became a patient of the Yarra Bend Lunatic Asylum. He never recovered from his mental illness and was transferred to the Ararat Asylum in 1887. He spent the rest of his life there. This case was resumed on Friday morning before his honor the Chief Justice and special jury of 12. The Attorney General, Mr Billing and Mr Fellows for the plaintiff and Mr Michie, Mr Wood and Mr Wyatt for the defendant. Wm. McCrae M.B. Chief Medical Officer was called and examined by Mr Wyatt and deposed as follows: I was formerly a member of the Board of Visitors to the Yarra Bend Asylum. At the commencement of the examination of this witness as to the condition of the Asylum, the Attorney General objected to any statement being made as to what passed between witness and patients or attendants, except in Dr Bowie's presence. There were some instances in which bags were used at the Yarra Bend Asylum for other purposes besides those of protecting patients from cold. Some of them were lined with flannel. In September 1857 I saw a patient named Dr Carr in a bag. The bag was not lined with flannel. He said that he had been kept in it seven or eight days. This statement was made in the presence of an attendant named Fitzgerald. The Attorney General again too objection to this line of evidence as the statement was not made in the presence of the plaintiff. His Honor allowed the objection to be good so far as the nature of any complaint was concerned, but observed that the second objection might have been taken to the greater part of the evidence addcued in the case. ↑ Dianne Campbell, Anglo-Irish Lawyers in Post Goldrush Ballarat, Masters theses, 2002, p.183. ↑ PROV, VPRS24/p, Box 24, Unit 23. This page was last edited on 24 November 2018, at 22:28.